There have been a number of posts and articles on the 1996 welfare reform law (TANF—Temporary Assistance for Needy Families), as it turned 15 last week. I argued that it’s a fair weather ship, performing far better amidst strong labor demand, foundering otherwise. My CBPP colleague Donna Pavetti posts some compelling evidence in that regard here too. Now, look at this trend in employment rates—share of the group with jobs—for low-income single moms (family income below two times the poverty level) from 1995 to 2009. If Rep Camp had made this statement in 1999, he might have had a case. But since then, the share of low-income single moms with jobs has consistently fallen, and, given a welfare program now conditioned on work, the safety net failed to adequately catch them and their kids. His whole statement is pure “supply-side” as if promoting work, wanting to work, being prepared to work, gets you a job. In fact, when the strong demand side conditions of the latter 1990s faded, the fair-weather ship of welfare reform hit the shoals. I bolded the last line of his statement, however, because there’s a way you can read it that actually makes sense. I happen to think he’s right that families want to support themselves, but go ahead and make all the rules in the world in all the safety net programs we have: if there are not enough jobs for people, they won’t be able to support themselves or their families through work. In this regard, ensuring “that gov’t programs support…that enduring American work ethic” means making sure people have jobs. It so happens there’s a great way to do that—a jobs program from the Recovery Act that was highly successful in helping the TANF population find work—read about it here. If Rep Camp and others want to preserve the work ethic, they’re going to need to help create some work. Share the post "Welfare to Work Doesn’t Work Without Work"
8 comments in reply to "Welfare to Work Doesn’t Work Without Work"
There are 4-5 people looking for jobs for every available job opening. 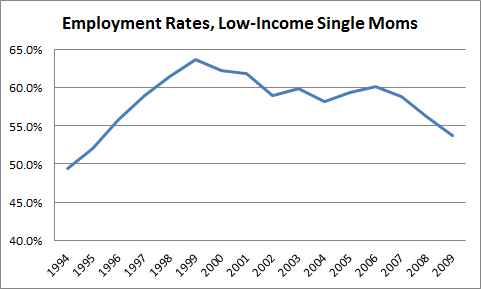 http://www.bls.gov/web/jolts/jlt_labstatgraphs.pdf (see chart on second page). No matter what their work ethic, or how low paid a job they’re willing to take, there is no way all of them get jobs, because there aren’t enough jobs. Clinton policies tied a lot of benefits to jobs. These policies made work far more valuable than welfare. However, in an economic downturn, these benefits disappear. How much do the resulting cuts in benefits to the lowest wage earners increase the severity of recession and prolong unemployment, because demand for goods and services depends on supplements given to those who have jobs? Does this serve as an “automatic unstabilizer” that makes recessions worse? Yes. But to plutocrats, that’s a feature, not a bug. Sick hosts are easier to drain. What happens if extended Federal unemployment insurance extensions are not renewed?. I expect that it will be a huge problem in retail and a huge burden placed on state welfare programs, more people will fall through the cracks, and a further contraction of GDP. I know there is some talk that long term unemployment beneifits creates a disincentive to find work, but what if there are no jobs? Sigh. This was always endgame — conservatives hate the idea of an American middle class. They peeled off the working class from the middle class with the false promise that they were going to stop there. You didn’t have to be faster than the bear, you just had to be faster than your buddy. Well, that’s only true if the bear is hungry for himself. If he’s just here to kill people, you’re much better off picking ground and making a stand together. People do want to work and we must do something about their inability to find jobs. We need investment projects eventually, and now is the time to do it. Temporary income tax hikes on the top one percent AGI, on dividends, and on capital gains could easily fund at least a couple million jobs without further busting the budget. This wouldn’t much affect demand levels from top-earners but would remove many people from the unemployment rolls and spur business expansion and hiring to satisfy the increased demand from the re-employed. The hikes could be cancelled once we’ve recovered sufficiently. The added economic growth would reduce longer-term deficit challenges. It’s time for the GOP to agree to temporary tax hikes to get this economy rolling to everyone’s benefit. In addition, as state budgets have come under pressure, the ancillary services for Welfare to Work programs, most importantly childcare, have been cut, leaving low-income mothers with few options but to survive on the margins. This has led to an increase in families with little or no cash income at all. Carol Plato, director of a Florida hospital administrator about the millions of tax dollars spent providing health care for illegal aliens is spreading like wildfire on the internet. are folded into working families bills. must pay according to income. according to americawave.com are contemplating moving abroad. as they’ve never been imprisoned for forgery. a basic function of government.